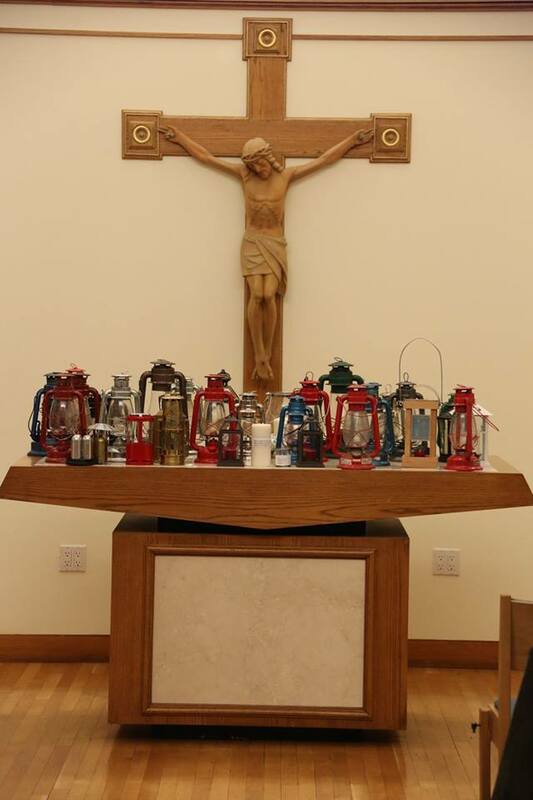 Note: The Peace Light will be available in the Synod of the Trinity and Presbytery of Carlisle offices beginning Dec. 3 and will remain until Dec. 14. If you would like to receive the Peace Light or want more information, contact Synod Communications Coordinator Mike Givler (mgivler@syntrinity.org, 717-737-0421). It seems as if terrorism and gun violence are spreading out of control. But there’s also a belief that peace can spread uncontrollably across the globe the same way. Lanterns await the arrival of the Peace Light from Vienna, Austria, at JFK International Airport in New York City. In an effort to show just how easily this can be done, the Peace Light flame will continue its tradition of traveling from a grotto in Bethlehem where tradition places Jesus’ birth around the world to North America. The Peace Light has been burning in Bethlehem for what is estimated to be over 1,000 years and each year a child goes into the grotto and brings out a flame that is then transported from Tel Aviv, Israel, to Vienna, Austria. During a Service of Dedication, the Peace Light flame is given to people who spread it across Europe. 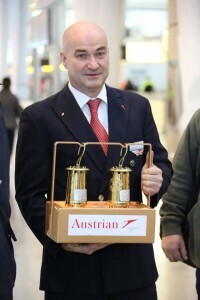 It is then flown by Austrian Airlines to JFK International Airport in New York City in two blast-proof miners lamps fueled by smokeless paraffin oil. From New York, it is distributed across the United States and Canada and put in select locations where the flame can be received by local churches and even put in people’s homes. Some congregations use the flame to light their advent candles, while individuals will blow out the pilot lights in their stoves and furnaces and relight them with the flame so that the light of Jesus is continuously in their houses. In 2016, the Harrisburg Patriot-News sent a reporter to our Light, Lunch and Lyrics gathering (more here) and produced a video that can be viewed here. The Peace Light travels overseas in two blast-proof miners lamps. The Peace Light is a project of the Boy Scouts. According to PeaceLight.org, “The Peace Light first came to New York in 2001 by Canadian Scouts who brought it to Ground Zero. In 2002, DHL delivered the Peace Light as a gift from Belgian Scouts and Guides to the Boy Scouts of America in NY,” and it has continued to this day. The initiative actually started many years before that in 1986 as part of a “Light into Darkness” program for needy children in Austria and abroad. And as was hoped, it has continued to spread each year. Since 2010, the flame has been brought to the Presbytery of Carlisle office in Camp Hill as a distribution location. Prior to 2015, the Rev. 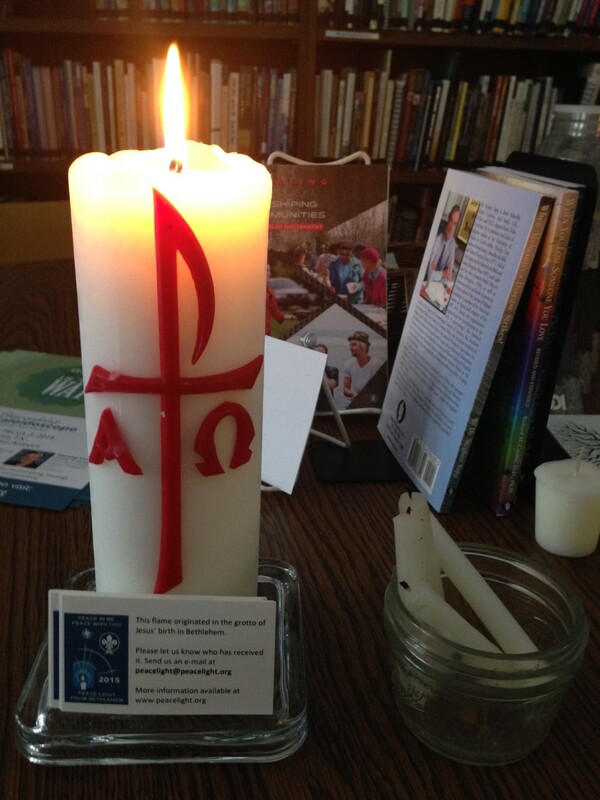 Martha Carlson, a pastor in the presbytery, brought the flame to the office, which is located in the same building as the Synod office. She would make the 75-minute drive to Reedsville, PA, (just north of Lewistown) to pick up the flame at the Juniata Valley Council of the Boy Scouts of America. 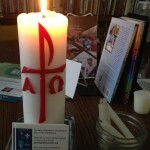 A candle in the Synod of the Trinity office waits for someone to take the flame to their church or their home. Each year the flame has been in Camp Hill, Mike Mittel of the Mason Dixon Boy Scout Council in Hagerstown, MD, has made the one-hour drive north to pick up the flame and return to Hagerstown to set up a distribution point. For media coverage of that event, click here. There are over 100 places in North America from Toronto to Minneapolis to Laredo, TX, to Seattle that the flame can be accessed. (Information on distribution points can be found on Facebook and through this spreadsheet. A distribution map is available here.) Having it spread like that is exactly the goal of the Peace Light program.